Wouldn't it be nice to have a magnetic dry erase board? Think about it. You never know when an idea might come to you—in the shower, in your car as you drive home, or even at the fridge while you choose your lunch. You can even use them for writing instructions or scheduling activities for the week. Now here's a shower thought: What if you used a magnetic dry erase board to promote your business? Customize your own dry erase boards with NextDayFlyers. They are perfect for company giveaways, especially for promoting your business to clients. Our larger size can be used as a memo board by your clients, for allocating house tasks, or even just for jotting down ideas. Printed on thick, laminated, 12 pt. material with magnetic strips, our magnetic memo boards will stick firmly to any metal surface. Our 8.5" x 11" board also comes with rounded corners and we include a dry erase pen and clip for free. Upload your own design today to customize your own. Give a fun twist to your marketing strategy! 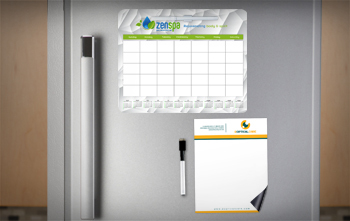 Large dry erase board magnets are mainly used as custom fridge notepads and can be personalized with your logo and contact information. Almost any customer can use one in their home for leaving notes and instructions. To make yours functional and engaging, here are 3 great design ideas. Put a grid design on your 8.5" x 11" magnet to create a whiteboard calendar. This is perfect for families to organize and allocate household tasks, and would make a useful freebie if your target market includes mothers and families. Another way to design your board is to make it an erasable "To-Do List". It gives an easy template for household planning and scheduling. If you are an art-related business, how about making it a doodle board? Showcase your products with these special freebies that your clients can doodle on. Turn away from a plain old notepad into something that is prime for collaboration.